Wonson Harbor during mine clearance operations, 1950. During the period 17 September to 6 October, 1952, Taylor (DDE-468) along with sister ship Jenkins (DDE-447) was assigned to duty in Wonsan Harbor. The mission was to provide some firepower to help protect the minesweepers we had in the harbor working at the clearing of enemy mines, but also to protect the islands held by the ROK Marines with USMC advisors. After that assignment, the CO of Taylor, Commander Sheldon H. Kinney, wrote the following article, which was published in the June 1953 issue of Argosy Magazine by Popular Publications, Inc. of Kokomo, Indiana. RAdm. 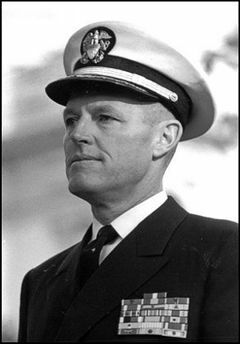 Sheldon H. Kinney, USN, (1918–2004) received the Presidential Unit Citation as commanding officer of USS Bronstein (DE 189) during World War II and commanded Taylor during the Korean War. He retired after after having also served in the Vietnam war, as Commandant of the Naval Academy and as President of the State University of New York’s Maritime College at Fort Schulyer, New York. The first salvo of enemy shells landed close, too close. They exploded on impact, making the characteristic kerr-whunk that you learn to dread in Korea. You could tell by the shock of the explosion that they were big, probably 155-millimeter. The shock jarred your feet and knees as the steel hull relayed the blow. Plumes of water rose, then fell back upon the disturbed surface of the bay. Fans of shrapnel peppered the water. Brown smoke hung over each shell’s grave. We were in a bad spot. My ship, the destroyer Taylor, and the minesweeper Heron had been neatly pocketed by shore batteries in the North Korean harbor of Wonsan. The Reds had held their fire until we reached a critical position. The timing was perfect. I didn’t have to survey the situation. I knew it all too well: navigation restricted by enemy mines; Heron’s speed and maneuverability limited because of her cumbersome minesweeping gear; harbor entrance (and safety) well astern, with additional enemy gun emplacements en route; no friendly aircraft in the area to give support. Yes, I knew the situation, and so did the Reds. The worst of it was that we couldn’t retaliate. There was no telltale flash of gunfire, no lingering powder smoke to tell us the location of the shore battery. Bridge and gunnery personnel searched intently for these clues that would permit us to commence the all-important counter-battery fire. The second salvo was even closer. Heron nearly took one aboard. Water from the splash landed on her forecastle. Taylor was straddled, one bullet over, another short. The shells seemed to be coming from Kalma Gak, the scarred and blackened spit of land on the starboard bow, but nothing disclosed the exact location. It looked like a bad day for the home team. The day had started off calmly enough. At dawn we were already inside Wonsan. Up at this latitude the Communists owned the real estate. We were there to prove that they didn’t own the water, not even the water in their own harbor. The first taste of winter was in the air. Good hot cups of signal-bridge “mud” were being nursed by the watch as the night-fireworks display of rockets, flash bombs, star shells and tracers gave way to the drab effect of daylight. At first light, our immunity from the enemy shore batteries ended. But daylight brought compensation in decreased danger from the deadly mines. It improved our chances of seeing the “drifters” that the enemy floated down on us with the tide. It decreased the danger of straying from the swept channel into the minefields. Thirty miles south of us the infantry front lines cut inland from the sea across Korea. During darkness we could see the beams of the big searchlights that enabled our troops to keep an eye on the enemy. Reflected from the underside of the clouds, they cast a shadowy light over the rugged terrain. As the visibility improved, the familiar landmarks of the harbor took shape and then line: the narrow-gauge railroad skirting the water’s edge; the roads winding into the hills that rose steeply to make a bowl of the bay; the city, airfield, transformer station, factories, warehouses. And everywhere the bunkers, caves, communication trenches and tunnels that pock the earth’s face where war brings its curse. The enemy held the land. The United Nations held the water. Each had purchased his holding with pain and death. “O.K., Bill, let’s see what looks good,” I said, and moved forward to give the OOD the dope. Our morning mission was shore bombardment. There is little glamour in naval gunfire at shore targets. The rate of fire is slow, allowing time for each shot to be corrected toward the target before the next is fired. Only when zeroed in is more than one barrel used. “Enemy troops repairing a railroad bridge north of town,” gunnery reported. ADs from the Essex had knocked it out the previous day. A few rounds of antiaircraft shells, their fuses cut to burst just short of the bridge, sent the troops for cover. “Cease firing, end of mission.” Shells cost money. The rail was cut, the repair troops driven off. The trains, which move at night, would not get through. Guerrillas had reported a new gun emplacement on Hodo Pando. Good time to show the gun that no immunity was granted to newcomers. Taking it under fire was mostly a gesture. Destroyer guns don’t demolish targets dug into the earth. That is for the 16-inchers of the Iowa or Missouri. We could finish off a gun with a direct hit, but just try to lob a shell into the mouth of a cave. We were lucky. The third round was just a little high. Our follow up with “rounds for effect” brought a landslide down on the gun and covered the entrance of its cave. The gun and any of its crew still alive would be dug out tonight. Life is cheap to the Communist, but weapons have high value. A pair of Air Force Mustangs reported boxcars in the marshaling yards. Could we take a mission? Could and would. I bent on a few more knots and headed for a good firing area. The cars had been left behind when their engine pulled out before dawn to hide in the nearest tunnel. Boxcars headed south meant supplies for the front lines. “Get us some rolling stock for the scoreboard, John.” I called to Lieutenant Hadley, the gunnery officer. The rail yards lay beyond some building, which blocked our line of sight. Fire would be indirect. We opened up. The Mustangs coached us on and kept the reports of damage coming. Mission accomplished, they made a low pass over the ship. Climbing out, each did a slow roll. It was the trademark of a pair of pilots we had worked with down at the bomb line. Old home week! They cleared the radar antennas by at least 20 feet. About nine o’clock the sporting portion of the day ended and the real work began. The minesweeper Heron, a wooden-hulled little rascal of the type that wins wars while we bigger ships skylark, stood in. Her job was to carve out mine-free water, enlarging the net of swept channels. Our job was to protect her while she worked. Watching her progress steadily through the entrance, I thought of the strange role of the surface Navy in the Korean War, and the primitive pattern it took. The enemy confronted us with no surface forces. They had been destroyed, such as they were, in the first weeks of the war. There was a minimum of air attack, thanks to the air superiority of the carrier and Air Force pilots. Submarine attack was a constant threat, but one which had not materialized. The enemy had to rely upon mines and shore batteries almost exclusively. With no Navy, his front lines extended not only across the peninsula of Korea, but also along both coasts, mines and guns were his coastal defense. And they were tough to deal with. With me, mines are a personal affair. I have been mined, and in a destroyer. Their quick death and destruction is not easily forgotten. You struggle in the sea, eyes smarting from the mucky fuel oil of your own ship and wonder how a live vessel can be so quickly converted to a mangled, sinking hulk. With Taylor riding shotgun, Heron struck out. Today’s assignment was a touchy one. It had to be conducted in a vulnerable corner of the harbor. The sweep would be under the bluffs of Kalma Gak, which was the principal enemy stronghold. Heron’s track was precise as she worked along. Somewhere outside the harbor, in the force flagship, it would later be recorded on a master chart of mineswept waters. The chart would not show the guns nor the mines that had not behaved according to pattern. The sun was out and the air was warming up. The calm waters of the bay made a destroyer sailor’s heart glad after the rolling and pitching of several weeks at sea. A year ago we could have anchored here. So many new guns had been added by the Communists since then that it was now suicide to slow below 10 knots. Yet the scene was peaceful enough. Peaceful unless you studied the details. There were skeletons of buildings that had been dwellings and burned and gutted warehouses. Twisted steel ribs that had been hangars stood in blackened earth where bombs, rockets and shells had detonated. Nothing moved. The enemy kept to his bunkers, caves, trenches and observation posts. Burrowed in the earth he enjoyed an immunity we on the surface of the bay were denied. To the north, rice fields lay in pattern. They seemed incongruous with the evidence of destruction and war. White-clad North Koreans could be seen through the binoculars working in the fields, their clothing standing out in sharp contrast to the mud. Heron chugged along, her series of sweeps bringing us constantly closer to the enemy. We were working into a corner pocket now, with known gun positions on both bows. A glance around the bridge showed a variety of emotions on the faces of my shipmates. It was easiest on those who were busy—steersman, lookouts, quartermasters, navigator, officer of the deck; hardest on those who only stood by—signalmen, comm officer and boatswain’s mate. Don Thompson, manning the primary tactical circuit, would be justified if he were nervous. He had been badly wounded at Salerno by German 88-millimeter batteries. He was taking it calmly, though, steady and composed. Familiar faces, partially hidden by helmets and the Queen Anne collars of life jackets, now looked strange. At sea, dungarees and baseball caps were uniform. Now, as precautions against flash burns from explosion, helmets were worn, trousers tucked into socks, sleeves rolled down and buttoned, and shirts fastened at the neck. The bulky kapok life jackets were more in the nature of body armor, protection from shrapnel, than flotation gear. “Shotgun, this is Exploder. I am reversing course to port.” The tactical voice radio crackled the message from the Heron. She had reached the inner limit of the assignment and would turn her stern to the enemy, probably with relief and pleasure. The officer of the deck shot an inquiring glance my way and I nodded assent. He commenced a turn to the left in order to keep clear. We had! The first salvo hit. The timing couldn’t have been better for the Reds, or worse for us. I jumped for the voice tube. “This is the captain. I have the conn. Right full rudder, all engines ahead flank, indicate five-five-five revolutions.” There was one thing to do and do fast: change course and speed. The refinements—to stand by Heron and get her out of danger, locate the battery and take it under fire—would come presently. Right now the important thing was to spoil the shot for the opposition. We had to change geography, and change it quickly. The mines flanking us were going to make it a ticklish job. A shell splashed on the port bow as Taylor leaned in a sharp turn to the right, hull vibrating from the acceleration of the engines. Just about where we would have been! The gang hadn’t yet found those guns. A lot of help we’ll be, trying to make it hot for a battery we can’t even locate. Heron was getting close ones now. Air support would sure be welcome. I directed radio to request it. Aboard Heron there was frantic work to cut loose the minesweeping gear. With her heavy burden she was a sitting duck. A cluster of men in dungarees could be seen on the stern working swiftly. Men jumped clear of the parting cables as cutters severed them with a single quick snap. Heron turned for the harbor entrance. She was making full speed but it was a pitifully slow full speed. It must have seemed bare headway to the little knot of officers and signalmen on her bridge. “Captain, the guns must be on a reverse slope. We can’t find them.” The gunnery officer’s voice held a mixture of anger and disgust. It was a grim feeling. Even free of her gear, Heron was an excellent target and we weren’t a bad one ourselves. Heron was still in mine waters, a few hundred yards from the clear channel. Taylor was swinging back toward her in a hard right turn. The shells kept coming. “A wonder they haven’t made a hit yet,” I thought. The navigation team quickened the pace. Cuts were rapidly plotted. They had to be accurate. An error would put us in among the mines. With luck, and if Heron’s speed was enough, we could erect a smoke barrier for her just as she left the minefield. The enemy’s view of his handiwork would then be cut off. Down in the firerooms, the black gang worked at top speed cutting in smoke burners. Excess oil sent heavy black clouds pouring from the stacks. Despite the vibration of the engines and the roar of the blowers, the sound of the exploding shells and their hammer on the hull were all too obvious to the engineers. It takes guts to stick to your job down there in destroyer machinery spaces. If we hit a mine, or if a shell struck the 750-degree, 600-pound pressure steam system, it would be lights out for many of these men. The navigator was plotting fixes as fast as the quartermasters on the alidades sang out the bearings. “Recommend three-five-two,” Ed yelled, not even pausing to look up from the chart table as he continued his plotting. “Ease the rudder—midships—steer three-five-two,” I chanted to the helmsman. A quick bearing on the Heron. Three-four-seven. Pretty far left? Heron, now sharp on the port bow and closing fast, took a close one. The spray from the shell’s splash showered her. Brown shell smoke mingled with the trailing diesel haze as the little sweeper passed through the disturbed water, throttles wide open. The noise of a shell exploding close to Taylor hit my ears. I resisted the temptation to duck down behind the chest-high windscreen that surrounds the bridge. It’s only aluminum, and thin aluminum at that, but when shrapnel is flying it holds the same attraction that a hole in the sand must have for the ostrich. “Very well, good work.” I hadn’t even known there was a fire! Probably started by the smoke generator, now red-hot from its job. Another quick look at Heron’s bearing, three-four-seven, steady bearing. The mariner’s nightmare. It spelled “collision.” It wouldn’t work. Even to protect lives aboard the sweep, you couldn’t take a destroyer and her 300 men into a mined area. But there was still a chance—slim, but a chance. It would call for teamwork on Heron’s part, automatic teamwork, for there was no time for communication. “Right ten degrees rudder. Come to zero-zero-two.” This would take a lead on Heron. If both ships held their course, Taylor would pass close in front of her. Unless her skipper saw what I was about, he would sure think that this was one hell of a time for a destroyer to bear down on him. The two ships closed the distance quickly. Heron commenced a left turn. It was all off. No, she was coming back. Bless you, Skipper, bless you! Heron had grasped the idea. As we churned across her bow with only feet to spare, she held course and dived under Taylor’s stern into the protective smoke. Looking aft from the bridge it was a sight to behold: Heron close aboard on the port quarter, the next moment invisible in the smoke, then out in the clear. A protective fence of smoke cut her off from enemy spotters. It must have caused some fancy profanity in the Communist league. One minute they had a nice, slow target that was almost zeroed in, the next their target had disappeared. Not even the top of her mast showed. Once through the smoke, Heron continued to play it four point zero. She altered course sharply to change the line of bearing. Even though the battery elevated, and still fired on increasing blind ranges, it would be off in deflection. The shells started to walk up our wake. It was time to benefit by the same immunity we had provided Heron. I put the rudder right full and reversed course. Taylor heeled sharply to port as she clawed around the turn. Now we were running behind our own smoke screen laying a second wall. As the first fence thinned and dissipated it revealed another to the Red gunners. They ceased fire. Our ships worked out of range toward the harbor entrance, Taylor zigzagging astern of Heron keeping the screen effective. It would be gratifying if that had been the end of the incident. It would make such a nice, neat package. No hits, two runs, and only Communist errors. Nobody hurt, not a square inch of a US naval vessel damaged. But it wasn’t ended. The Communists were plenty mad. Their failure to score on a sure thing would cause much face to be lost. They opened fire on an island in the harbor held by our ground forces. We still couldn’t see the battery, but the beating the island was taking was apparent. On the walkie-talkie circuits we could hear our troops. One of the first rounds had hit a bunker. A Marine was severely wounded in the chest while his buddies suffered lesser wounds. The leathernecks were prepared to beat off any attempt to take the island, but they couldn’t cope with guns this size. The island rose steeply out of the water. On its top was an observation post. I wondered if from it they could see the guns. The answer was quick in coming. “Shotgun, this is Magic Isle. Enemy battery, co-ordinates 5G36T2, estimate three guns, 100- to 150-millimeter. Can you suppress?” My admiration for Marines has always been tops, but this really did it. The voice on that radio was as calm as though engaged in a telephone conversation, as accurate as if it were operating from a business office instead of crouched in a muddy OP, picking co-ordinates off a cloth-backed grid while the earth spouted the impact of shells. The target would be hard to hit. Our guns would not be particularly accurate even at the closest point. A poor chance of hitting the offender, an excellent chance of being hit. Lots of sound arguments against going in. But men were going to be dying on that island if we didn’t risk it. A destroyer has 60,000 horsepower packed in her turbines. I called on a fair share of it as Taylor leaped ahead, screws biting the water with a vengeance. Rounding the island, we steadied into the swept channel leading to the shooting gallery. The sun was just right for observation of the guns. Once clear of the island and headed in, we could see puffs of smoke on the hill behind the city, and the telltale flashes of gunfire. They looked a thousand miles away. Even at the bitter end of the channel this was going to be a tough shot to make good. Glancing back over my shoulder, I saw Sayer Snook, the main battery director officer, slew the director onto the target. The optical rangefinder operator sang out ranges on the puffs of gun smoke as the distance closed. Below decks, in the main battery plot, the fire-control men cranked inputs to their computer. In the magazines, sweating crews passed powder and shells toward hoists, now full, but soon to be hungry. In the gun mounts the crews stood tense, sealed in by their protective shielding from sight of the target upon which they would fire. Once again Taylor came under fire. No secret now about our destination. Just as well not to think of what would happen if a shell found our explosives, shells, powder, torpedoes, hedgehogs and rockets, or found its way to one of the boilers. The range was still too great for Taylor but it suited the enemy fine. Their pattern was not too effective here, but it would be a different story when we got in close and had to slow. A gun opened fire from the shore on our starboard bow, much closer. It was a 76-millimeter, with a flat, dangerous trajectory. It made you hunch your shoulders up toward your helmet. Don Gordon in the after director got off some fast rounds of smothering, three-inch shells and the enemy ceased fire. A shell landed ahead, more disconcerting than those on which our backs had been turned. Good chance to slow for a change of pace and throw their solution off a bit. I came down to 15 knots, and altered course to the right. We were nearly in range now and the five-inch battery was preparing for work. “Surface action—PORT,” the control officer snapped his command over the circuits. The guns trained out. “Shift to automatic.” Their barrels vibrated like tuning forks as the synchros locked them in with the director. “Mount one—load one Willie Peter.” White phosphorus shells would make it possible to locate quickly and correct at this extreme range. Only one barrel to shoot until we had their number. Mount One let loose. There was the wait that seems eternity for the shell to complete its flight. A small white plume appeared on the hill. Short and left, but easily visible thanks to the phosphorus, and amazingly close for this long range. The answer came in the form of another shell from the enemy. If we didn’t get these guys away from their guns soon, we might never have the chance. Despite the scientific techniques, there would be a lot of luck in correcting onto the target. Be with us, Lady Luck! Long, and almost on in deflection. The Red gunners would know that their picnic of tax-free gunnery was about to expire. From now on they would have to duck as well as shoot. “Kerr-whunk.” That one was too close for comfort, not more than 30 yards over. Must have passed between the stacks! “Plot—Sky One—left two-hundred—drop three hundred—all guns load high capacity point detonating. We will fire five salvos for effect.” A moment of silence. You could hear the breaches click as they closed behind their load. Taylor heeled to starboard with the effect of the full salvo. Four more salvos followed in rapid succession. The first shells were still in the air when the last rounds left the muzzles. Black smoke rose on the hill as the first salvo landed. It looked good. It could have done some damage. At this range you couldn’t be sure. The second salvo hit and added to the area of dirty smoke. It was lucky salvo three that brought us the most beautiful sight of the year. Close on its heels a white geyser shot up hundreds of feet into the air, billowing out as it rose. Seconds later the concussion wave of the explosion slapped us in the face. One look was enough. I didn’t waste time looking for the fourth and fifth salvos. They would be lost in this surprise bonus. The channel end was close. It was time to get the show on the road. Ed left the jubilant group on the wing of the bridge that was watching our Vesuvius. He headed for the chart table, a broad grin on his face. That’s the way it happened. It was one action among the many that go to make up the Korean War. Lady Luck made its outcome a lot happier than many. If you read about it in your newspaper it probably wasn’t very impressive. But for a “Taylor sailor” it was a day to remember, a story to be retold.